U is for Upside Down…Cake that is! I entered this cake into a recipe contest over a year ago. I didn’t win or place but that is okay. The excitement for me is the challenge. I enjoy creating new recipes, coming up with new ideas and pushing my mind to the limits of creativity sometimes…even when the idea seems so simple. This cake is great as a dessert but I also found it to be a nice breakfast item…picture a slice with a little coffee in the morning. You’re looking out the window, sitting on your patio enjoying the beautiful morning. Haha – Enjoy! -Preheat Oven 325 degrees. Grease one (8-inch) round pan – Earth Balance (Vegan Butter) or cooking spray, if you prefer. -In mixing bowl, combine dry ingredients: flour, baking powder, salt and ½ Cup brown sugar. Stir together to combine. -Add wet ingredients: Apple Cider, Water, Vanilla and Applesauce. Stir to combine but Do Not Over mix. 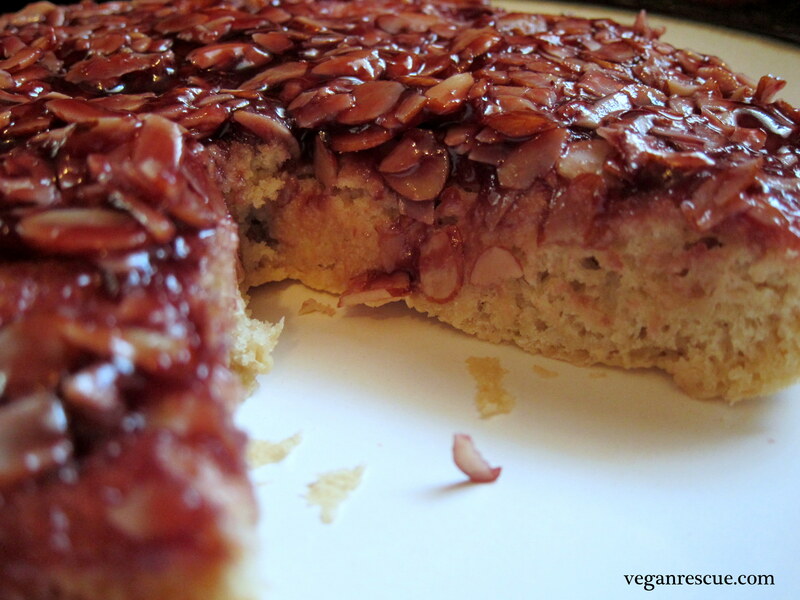 -In a separate Bowl mix together Raspberry Jam, Sliced Almonds and remaining Brown Sugar (1/4 Cup). -Place Raspberry mixture in the bottom of the baking pan. Then top with cake mixture – Be sure to spread evenly. -Bake for 30 minutes at 325 degrees until inserted toothpick comes out clean. -Run knife around entire edge to loosen cake from pan. Let cool for 10 minutes. -Place pan over plate and turn out cake onto plate. (Note: If some of the topping sticks to baking pan, scrap out with spatula and spread it back over the cake to make it look pretty).